Last week I hosted a peer group breakfast for 26 CEO’s. Every two months a group of CEO’s get together, away from their Board of Directors or staff and learn from others about the Leadership journey. Know your stuff and be confident in what you do. People need to know where they are going. They expect it and your role is to create and share the vision. A culture of learning will help you with change and change is constant in a growing, thriving business. Deeply understand the mind of the customer so as to extract the most value from your market. Remain very connected to your market. The power and influence of social media is huge. Understand it and be part of it. Get the detail right with good systems and processes. Employ and lead people who are good at the things you can’t be good at. Have good Governance in place. The biggest issue is keeping up with growth (and change). Make mistakes and then allow the people who made them to learn and grow from them. One of the things that really stood out to all those listening was the depth of understanding John had of his key markets and the people who use Synlait Products. He was able to very quickly articulate what end users want, need, expect and what must happen to ensure it successfully gets to market. I learnt a lot and the follow up questions and discussions were extremely valuable as others interacted and shared their experiences. It is amazing where a farm boy from Waimate can end up! 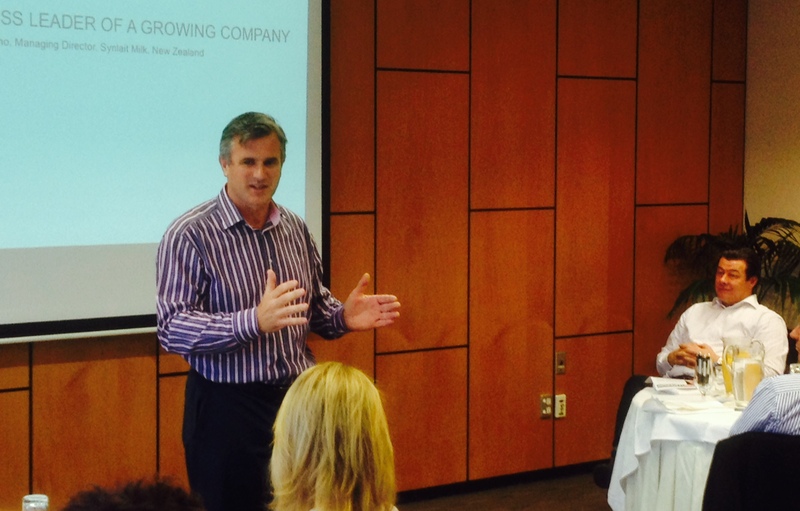 CEO of Synlait Milk, Dr John Penno shares his leadership journey with other Canterbury CEO’s.